﻿International Day of Sport for Development and Peace: Calendar, History, Tweets, Facts, Quotes & Activities. The International Day of Sport for Development and Peace celebrates sports and their widespread contribution to education, human development, a healthy lifestyle and world peace. The day also serves to raise awareness for the positive influences of sport on the advancement of human rights, and both social and economic development of nations worldwide by encouraging social inclusion, fair play and team spirit. In 2008, it was estimated that over 1.53 billion people were not active enough; inactivity is the leading cause of diabetes and heart diseases. 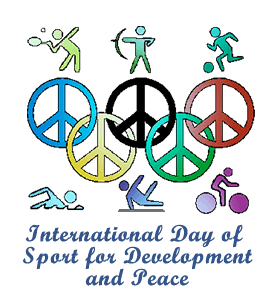 The International Day of Sport for Development and Peace was proclaimed in 2013 by the United Nations. It is celebrated annually on April 6th, a day that was originally used to celebrate physical activity in the world as it coincides with the first day of the first Olympic Games in 1896. As of 2003, there are 8,000 sports, according to the World Sports Encyclopedia. The first Olympic Games were held in April of 1896 in Athens, Greece. At this point, only men competed, only 9 sports were part of the games and only 14 countries competed. The most popular sport in the world is Football (known as Soccer in North America). According to FIFA, there are an estimated 265 million football players in the world. During World War One, a Christmas true was declared between enemies. British and German soldiers played football in what was earlier that day a battlefield. It was a temporary peace that was met with impromptu playing of sport. According to the Global Status Report on Non-Communicable Diseases from 2010, 35 % of the global adult population is overweight. Watch a movie that shows the value of sport in development and peace such as Cool Runnings (1993), McFarland (2015), Invictus (2009) and Unbroken (2014). Help organize and take part in a sporting event for underprivileged kids such as KidSport or Right to Play International. Any amount of money donated goes toward helping underprivileged kids get involved in sports and keep them happy and healthy. Take a picture of you playing a sport and post it on social media with the caption Sport, Peace, and Development. Use the hashtag #iplay, #InternationalDayofSportforDevelopmentandPeace or #IDSDP on social media to spread awareness. Assess your current physical health and get active. Most heart diseases, diabetes and cancer cases are largely due to inactivity. Aps such as My Fitness Pal, Apple’s step counter and Garmin Connect can all help you monitor your fitness goals. Organize a friendly match between two groups of friends or families. Pick a sport of your choice and get everyone involved in friendly competition.